Since every crawl space is different we can only extend advice on this website for common problems and questions with installing “conditioned crawl spaces“. If you have questions that are not covered here please feel free to call us or email us, you will find the contact information on our “Contact Us” page. With any job, preparation plays a huge factor in the quality of the final product. Crawl space encapsulation is no different. For the most part this is going to be a difficult and unpleasant place to be for a few days but if you commit to seeing it through you will be rewarded by not having to go back down there except for maintenance on your home. You will need a good pair of coveralls for everyone that works in the crawl space. ALL sharp and organic (wood, paper etc.) objects need to come out. If there is currently old plastic down there you can leave that and go over it but every thing else comes out. Old school taught us to put fiberglass insulation in the floor joist cavity to keep the house warm, today with a conditioned crawl space this practice is no longer endorsed. Moisture gets trapped inside the insulation, which makes it heavy and causes it to fall. It also creates the condition for Mold growth. The only place that needs insulation is around perimeter rim joist and/or the foundation walls, I will explain more about this a little later. While you are in the crawl space cleaning it out take a look at the structure, joists and beams to make sure they are in good shape. It would be wise to broom the joists and subfloor before you install the crawl space vapor barrier to remove old spider webs/nests and to get any loose dust or dirt down. You will also need to brush off the block foundation so the Foundation Seal Tape will bond properly. Dry crawl spaces offer fewer obstacles that wet ones. But dry crawls have their troubles too, most often the dirt is hard and uncomfortable to move around on. The dust levels are going to be quite high so a good respirator (not a dust mask) is required unless you want to cough up dirt for a week. For obvious reasons it is not good for your health. Our customers report to us regularly that there is not water in the crawl and never has been. The problem with this information is the homeowner only looks down there once maybe twice a year. There's a lot that can happen in a few months which includes water coming and going. It is not uncommon for crawl spaces to be dry most of the time but in the rain season they are under 12? of water. The object of conditioning your crawl space is to do it right and do it once. So don’t think because it does not have water in it now it has never had water. There are some things you can look for to tell you if there is a water problem. Look on the walls (usually at the bottom) for a white powder, it looks like salt. This powder is lime that is used in the making of the block. If you see it then you have some degree of water problems. Look to other signs like water stains, wet block or areas in the crawl space that are muddy. The bottom line is this, it will be easier and cheaper to install a sump kit (and drain tile if needed) first than to have to go back and do it after your crawl space floods. If it makes it any easier to decide you can think of a sump as a drain in case a water line breaks or your washer overflows. If you determine that you do need or want a sump pump there are a few things to consider. The first is where is the lowest point in the crawl space and second where is the water going to once it leaves the crawl space. 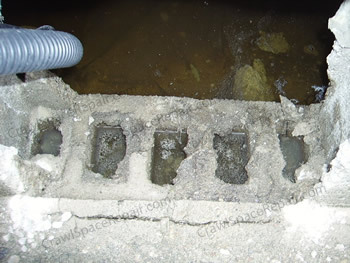 Most often the water that gets into the crawl space comes from poor drainage or poor grade. If you discharge the sump where the grade slopes back toward the house the water will come back in, we call this “cycling the water” and it is only good for the electric company. If your problem is poor drainage then you may want to consult with a local water management company. If you are polite and stroke their ego a little they will probably give you some free advice (I know that works on me). If you have a lot of water you will want to bury some drain tile (tubing) on the inside of the crawl space around the foundation walls. The most common question I get when it comes to installing drain tile is “Do you slope the tile down towards the sump?” The answer is NO! Water finds its own level, water is what we use in our tools to tell us what is level. If the tile is installed level (or very close to it) the water will drain into the sump. If you dig the drain tile on a slope you will be to deep by the time you get to the sump to tie it in properly. When you install the sump basin dig the hole about 8? wider than the basin and set the basin with pea stone around it. This will keep the dirt out of the basin and save your pump from burning up. The drain tile may need stone as well if the dirt is sandy or like top soil. Some people (including us when the head height is less than 20?) use tile with a sock on it. This is a good option but the pea stone works much better. The only other note I want to make is plan for putting a dedicated outlet for the sump. If you are handy and feel comfortable doing this then you will save some money but if you do not know what a dedicated outlet is then you should plan on calling an electrician (have him out after the SilverBack™ is in, he will charge you less). Bigger is better, right? Well, not always. We offer several different thicknesses of crawl space vapor barriers to accommodate different needs. 12 Mil crawl space liners is popular because it is not the thinnest and it is not the thickest. The 20 Mil vapor barriers are recommended if you have enough room and plan or would like to store items in the crawl space. It is much more durable and will handle the “scooting” of totes much better. It really comes down to your budget and the plans you have for the crawl space after it is finished. If you never go down there and probably never will except for home maintance then the 12 Mil vapor barrier will get the job done. On the other hand if you simply do not know what the plans are for the crawl space or you just feel more comfortable with a thicker product you may want to look at 20 Mil crawl space liners. Ultimately you can not go wrong with any of our products they are all top of the line.